Ever since I was a young ghoul I have loved Halloween. Any excuse to get dressed up in creepy clothes and celebrate horror and spooky treats. As far as I can remember I was always fascinated with spooky stories and as I got older this thirst for tales of horror grew. Witches, demons, zombies and gore always leave me wanting more. My love of horror films is no secret. I went to university to study film and learn more about how to make these amazing stories. Special FX has always amazed me. As a kid watching horror with my friends while they screamed as guts were spilled I always thought "Wow how did they do that". Horror can be true art to just plain fun but it always keeps your imagination running like a girl trying to escape the clutches of a slasher. My love for Halloween was so strong that for two years I ran the Halloween Monster Movie Challenge in Birmingham. Influenced by the punk rock attitude of Troma's do it yourself style of film I really wanted to give everyone a chance to make something. The true spirit of Halloween is getting creative and having fun. Although I didn't set up the Halloween Monster Movie Challenge originally I did put my own spin on it for the two years that I ran it. I wanted to use horror to help show case local talent and creatives as well as helping boost independent businesses. I wanted to put on a night that everyone could enjoy and celebrate. 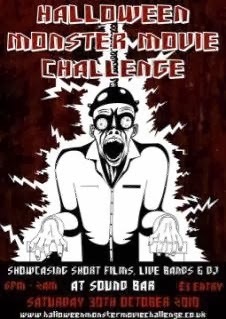 We invited film makers new and old to make a short film featuring a Monster and gave a line of dialogue that must be included sow e knew the film was made for the challenge. The response was amazing. I wont deny it took a lot of had work and promotion but I couldn't have been happier with the films that came though my letterbox. We have a lot of growing talent in the Uk and we really need to embrace it more. On the actual night we had awesome bands on the first year meat hook played for us. If you haven't heard them check them out here as they are a really hard working band and also really lovely guys. So much so they also played the second year for us. On the second year we also had the lovely Rotunda who I went on to make a music video for. Not to forget the super fun 8 bit ninjas who I will tell you all about in a future post when I show you the video we made together. In all the challenge was really successful we got sponsored by gore zone in our second year and gave out two really great trophy. Plus got to meet some amazing new talent, fun people and not to mention dress up! Until then have a Fangtastic Halloween! !